Roll out the barrel and we’ll have a barrel of fun. 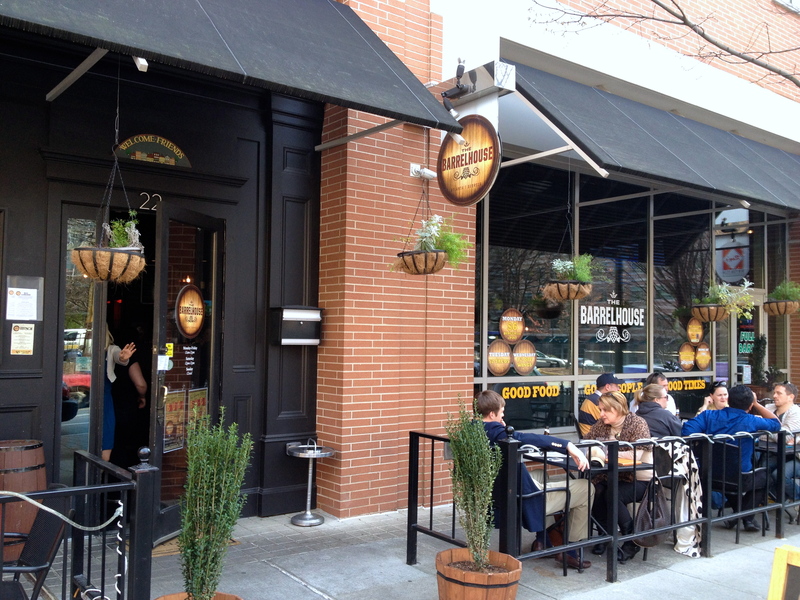 Occasionally Date Night will purchase a Scoutmob dinner deal, and we are usually glad we did. We are introduced to previously unknown establishments with fun package deals. Tonight we experience college campus bar ambience along with student food and beer prices. We never complain about that. Too cold for us outdoors, but in the coming weeks, it should be nice out here. We are in “East Georgia Tech”, right across the street from The Biltmore. Twenty years ago this area was in rapid decline but ever since Tech jumped over I-75 the area has been totally revitalized. The bar is close to all of the tables. 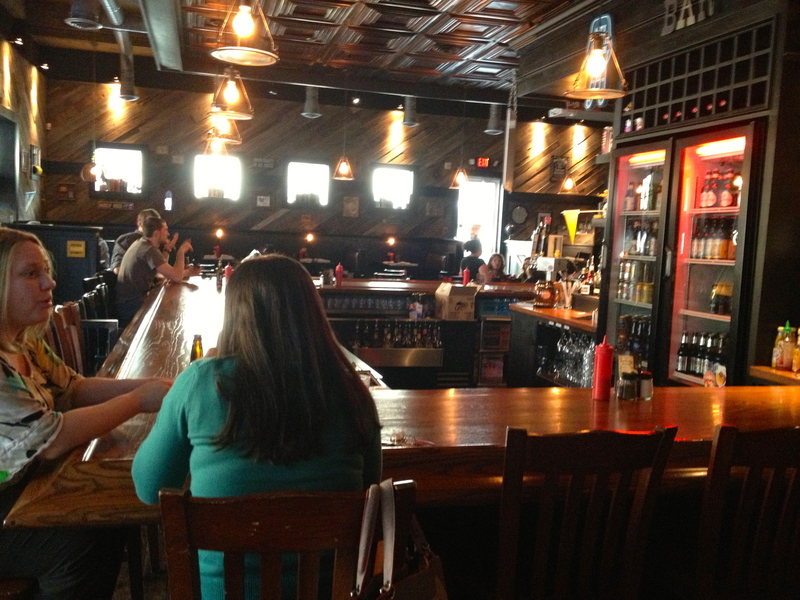 Inside the Barrelhouse, it’s dark, but they have some neat “up-cycled” artwork on the walls. 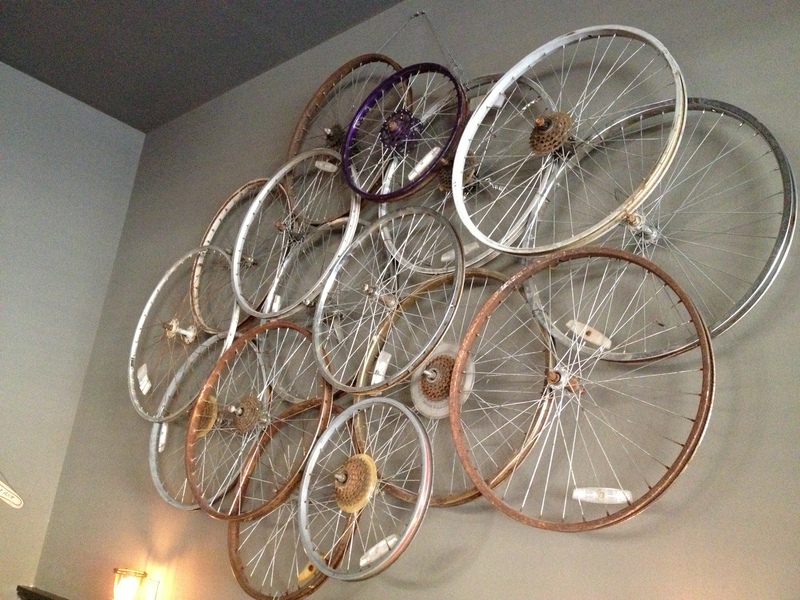 Since we cycle a lot, we enjoyed this piece of art. 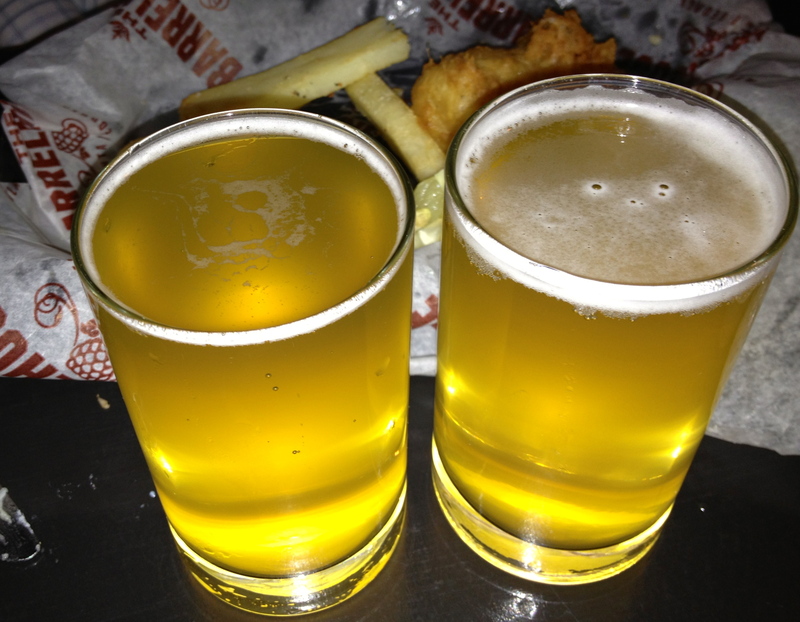 Our Scoutmob gets us two shots of pickle soup, two entrees and two flights of three beers. This lets us taste almost all of the draft they have as there are only four taps behind the bar. 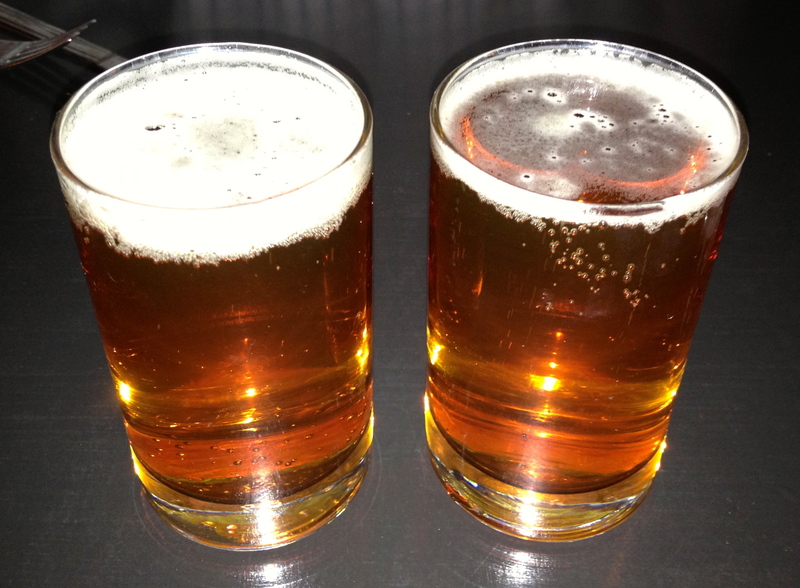 There is a good selection of bottled beer, and to get the students in here, the prices are very reasonable, both for the drinks and the food. First up: New Holland Saison Monkey (Michigan). Second flight: Copperhead Spring Fling (Kansas). Last flight: 21st Amendment Hell or High Watermelon (California). 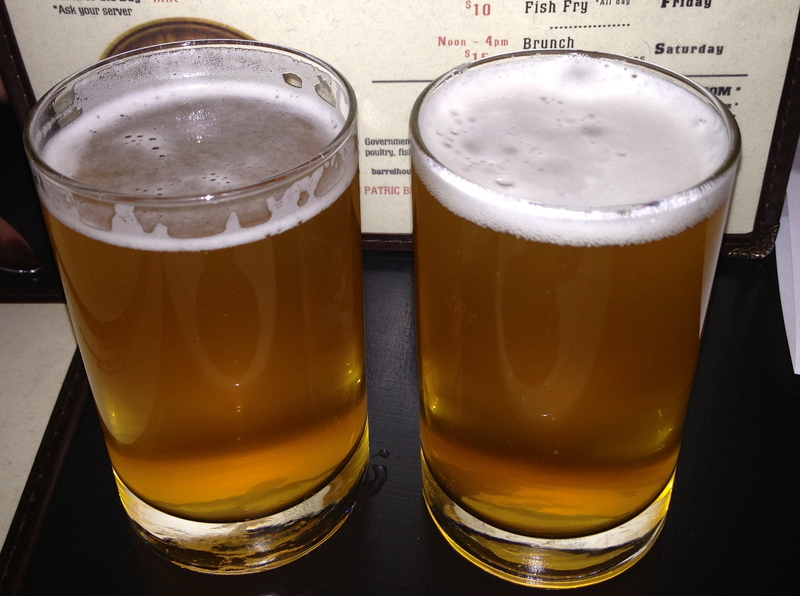 We like the Saison Monkey best. The Spring Fling was sort of hoppy (though not bitter). The third beer did have the distinctive taste of watermelon so they weren’t kidding around with that name. Think Jolly Rancher watermelon candy. How about a shot of pickle soup? 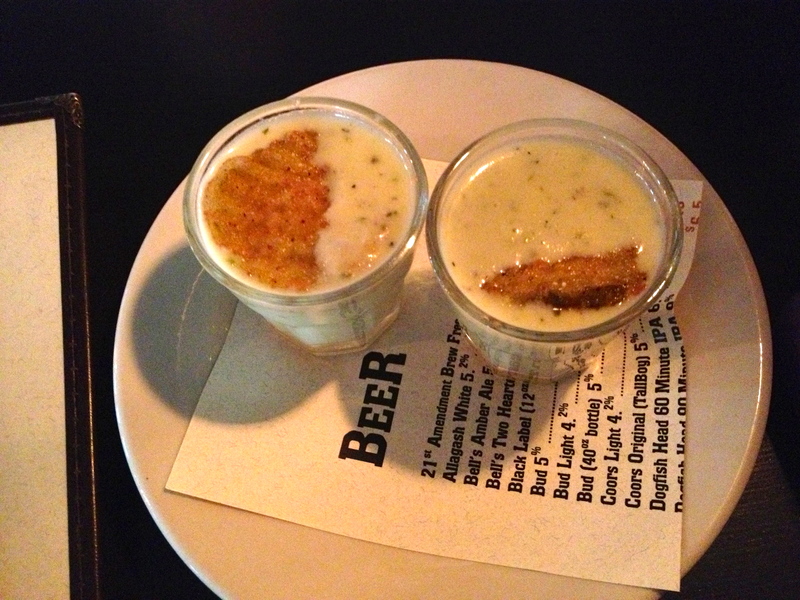 We don’t really know what to expect with the pickle soup shot, and are pleasantly surprised. Served hot and with a fried pickle slice on the top, I find that I want more than just a shot. It would be easy to eat an entire bowl of this tasty concoction. We each select an entree knowing that a “to go” box will be needed because we must save room for dessert. Baked chicken with mash and Brussels. We choose Herb Roasted Chicken and Fish and Chips. The half chicken is served with 2 sides so we are talking about a significant amount of food. 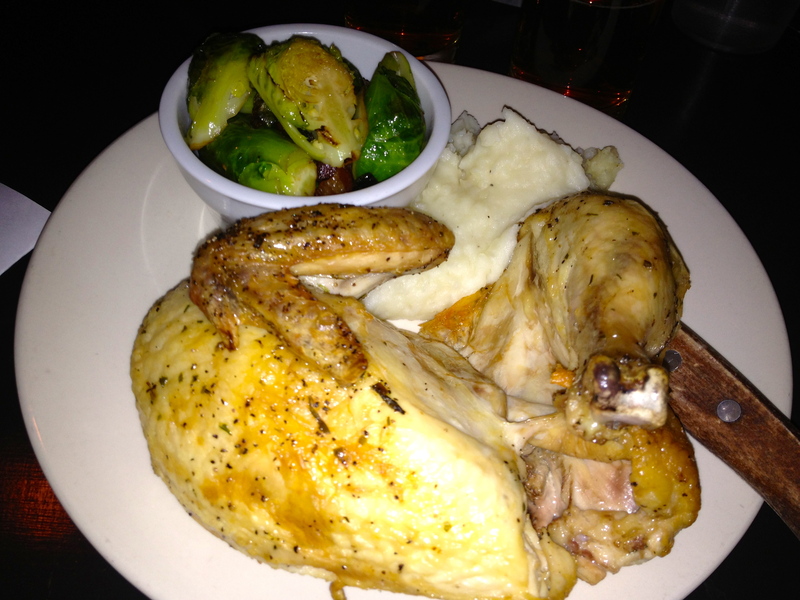 We pick Brussels sprouts and mashed potatoes to accompany the chicken. 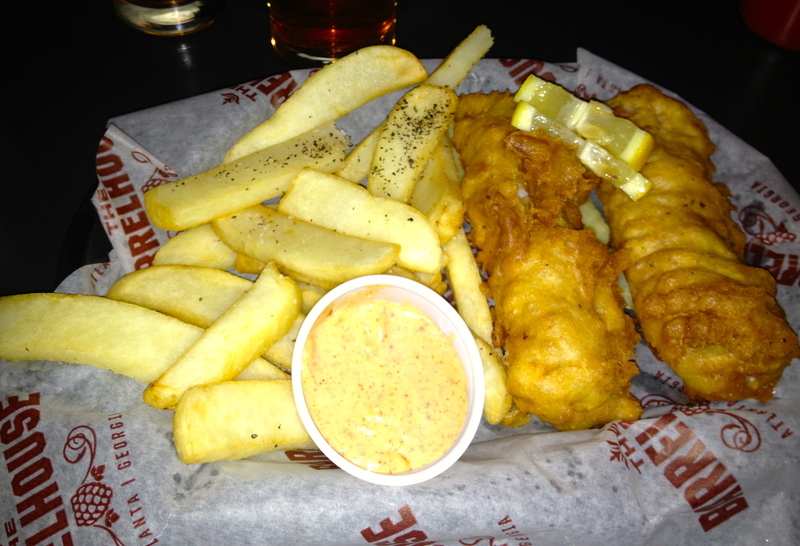 Fish and chips. Very British. The food is good but everything is just a little undercooked. The fish and chips needed to stay in the fryer just a little longer for that perfect brown and perfect crunch. The chicken is moist, but we miss that brown, crisp skin that is so much more appealing. And the sprouts are a little too crunchy for our tastes. Cream cheese ice cream instead of cream cheese icing. Nice touch. The heavenly dessert makes up for everything. 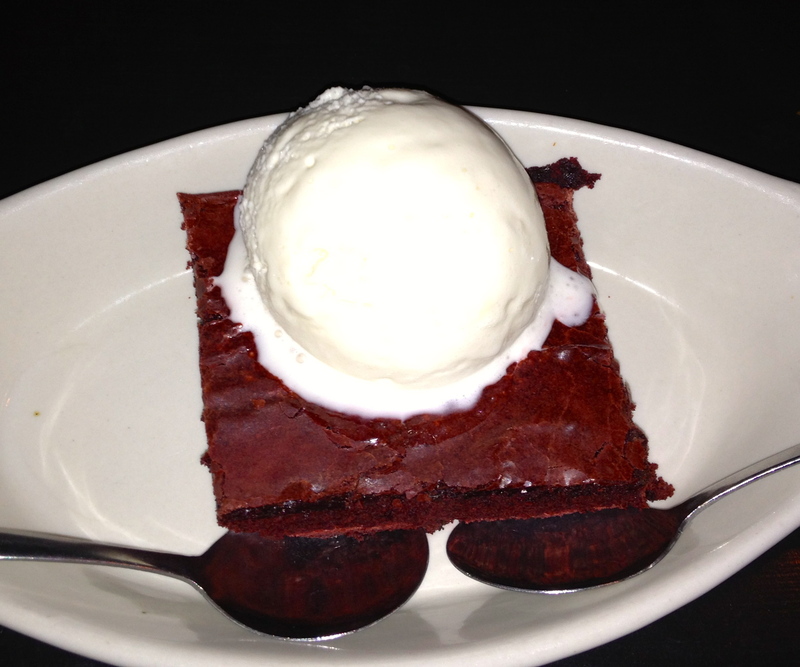 The red velvet brownie with cream cheese ice cream is to die for! Moist cake and spot-on ice cream make us thankful that we are served a generous portion. Is the Scoutmob bargain worth it? You bet, and unfortunately for you, it’s sold out. We enjoy dinner and drinks in a casual atmosphere, we take home leftovers which provide more than one lunch, and we save just over 30% on the check.